A solid device for bringing you loads of free disk space, this Hitachi 250 GB hard drive is reliable and fast. Small business owners and technophiles appreciate the design and speed of this internal hard drive. 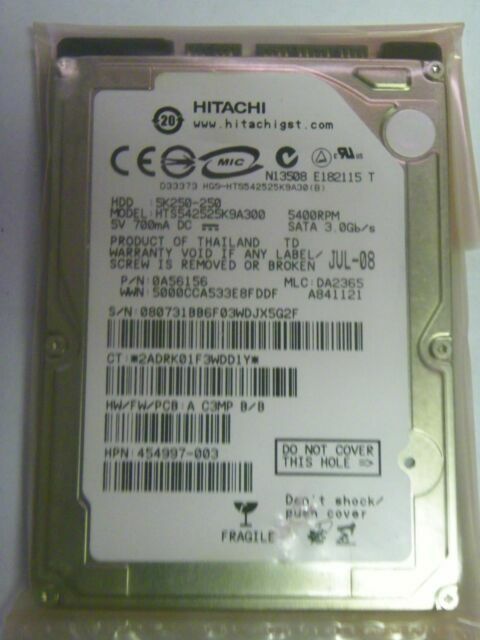 This Hitachi 250 GB hard drive is a capable choice for replacing your old hard drive. Because the Hitachi TravelStar 5K250 HTS542525K9A300 features significant storage space, you can store all of your cherished data files, high-definition videos, and mp3s with plenty of room to spare. This Hitachi 250 GB hard drive is wonderfully dependable, featuring great build quality, allowing you to enjoy the benefits of long-lived trouble-free uptime without fearing loss of data errors or component failures. This internal hard drive has a lightning-fast 5400 RPM speed, therefore you can access a multitude of documents, games, and applications very quickly. In addition, the Hitachi TravelStar 5K250 HTS542525K9A300 is very easily installed, so you can quickly make use of it in machines compatible with the SATA II interface.